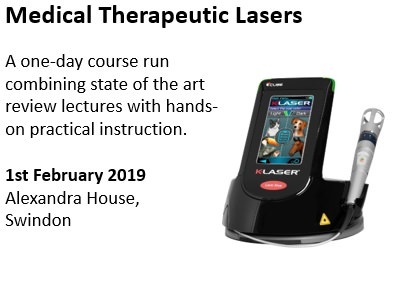 A one-day course run in conjunction with Improve International aimed at vets and nurses combining state of the art clinical review Laser Therapy seminars with hands-on practical instruction. Class IV lasers deliver specific red and near infrared wavelengths of laser light to induce a therapeutic effect within the patients body, including; increased circulation, decreased swelling and inflammation, reduction of pain and enhanced tissue repair. Laser therapy is used for a wide range of applications, including; osteoarthritis, pain management, post-surgical rehabilitation, dental/stomatitis, acute and chronic wound healing and lameness.